A few months ago, I was asked by my friend, Donna H., to donate my cooking services (cooking class and a meal) for a charity fundraiser silent auction. Her friend, Judy, runs after school programs in Camden for kids to have gym/sports/events to do after school. It keeps kids focused, doing something positive and off the streets in what is without argument, the most violent and depressed city in America. How could I refuse to offer my services for a worthwhile and kid-centric cause? I couldn't. I donated a cooking class and dinner party for 6 people, at their home, within an hours drive from Collingswood. After I made up the flyer, I sort of forgot about the donation. A few months later I was contacted by the winner and he asked if we could organize the event in May. The family that bid on the item at the silent auction lives in Collingswood - about 2 miles from my end of town. We quickly decided on a Mexican-inspired menu, since Jay and Jodie, had recently been to Mexico on vacation. 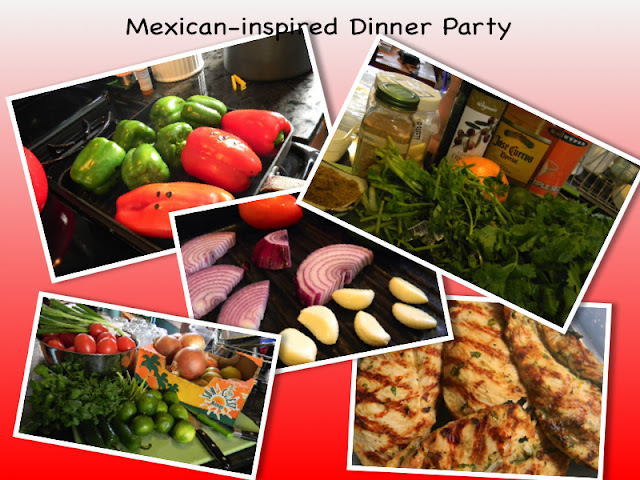 I love Mexican food and frequently cook Mexican-inspired food. My salsas are sort of "famous" (! says me! ), and I make a mean fajita and sloppy Jose medley. I couldn't wait to create a fun simple menu for this party. Jay and his wife, Jodie, are fun, laid back people. Foodies, into good wine and spirits and happen to be in the food industry. Jay's family owns a fabulous restaurant supply company in Philly - so while I didn't personally know him, I was familiar with his company. A few email exchanges back and forth and the date and menu were set. I opted to make a modified Rick Bayless version of grilled guacamole (with my own tweaks of course! ); Margarita Chicken (a tequila, lime, garlic and cumin marinade fiesta! ); Jicama, Radish and Watermelon Salad with Cotija Cheese; and for dessert - Mexican Chocolate Pots de Creme (Mexican Chocolate, Chipotle and Cinnamon). Muy Delicioso! I got a small taste before this bowl was EMPTIED! I'll be posting each of the recipes over the next week or so, since there are four to share (the Pots de Creme is a Mexican version of my low-fat pots de creme found here.) Today's offering was definitely my favorite of the whole menu - Grilled Guacamole with Oranges. It's unique but not bizarre and easy enough to make. You grill onions, jalapeño, garlic and tomatoes then diced and added to the avocado. Everyone at the party loved it - cleaning out the very large bowl in which I made the guac! This, along with the other menu items will be sure to be a part of my new favorite party menu. Grill the garlic, jalapeño, onion and the plum tomatoes, charring them over an open flame, the stove top or on a grill pan. The garlic, jalapeño and onion should start to become soft and charred; the tomato should char and soften but not fall apart. Cook for 10 to 15 minutes, depending on heat source and how hot your grill surface is. Set the vegetables aside to cool. While the vegetables are cooling, zest the orange (reserving the zest) and supreme the segments, cutting away the skin and pith of the orange. Use a work bowl to catch the juices. Use a sharp thin knife and cut the orange segments from between the white membranes that divide them. Cut the orange segments in half and add them to a bowl to catch the orange’s juices. Zest and juice the lime as well, adding the zest and lime juice to the bowl along with the orange zest, segments and juices. Set aside. Cut the avocados in half, removing the pits and scooping out the flesh. Place the avocado into a mixing or serving bowl. Pour in the orange segments and orange juice and lime juice. When the grilled vegetables are cool enough to handle, chop/mince them - mince the garlic; small dice the jalapeño (work carefully! and wash your hands immediately after handling the jalapeño! ); small dice the onion and small dice the tomatoes. Add all the vegetables to the bowl with the avocado and cilantro. Stir to combine and mash half of the avocados - but leave it on the chunky side. Season to taste with Kosher Salt and Freshly Ground Black Pepper. Drizzle some olive oil over the top and serve immediately with tortilla chips. If serving later, cover the surface of the guacamole with plastic wrap touching the surface. Refrigerate until ready to use - but use within a few hours of making. For hotter/spicier guacamole, add in the seeds of the jalapeño or a few dashes of hot sauce. Serves 6 - 8.